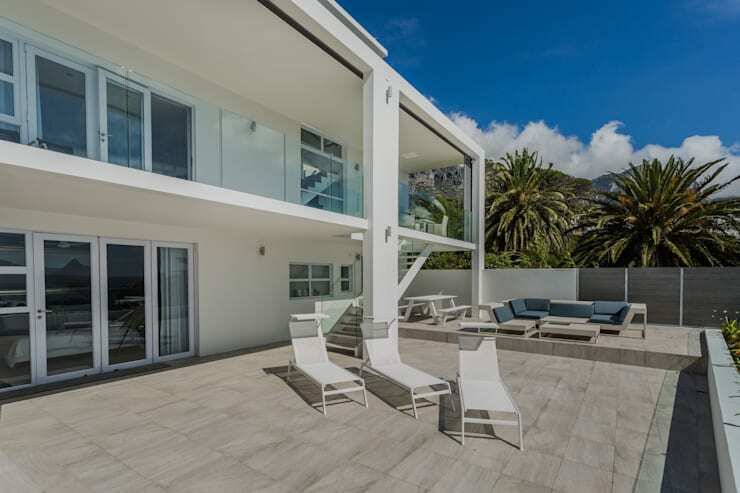 Today’s homify 360° piece couldn’t have chosen a better spot – Camps Bay, an affluent suburb of Cape Town which draws a multitude of locals and international tourists all bent on having some stylish fun in the sun. 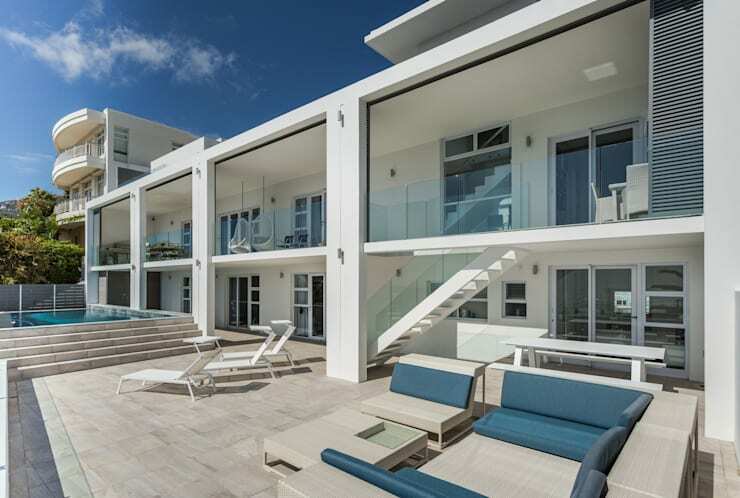 Courtesy of Babett Frehrking Architect, this beachside stunner hits all the right notes with class. But we thought we’d focus on the hot-spot of the residence: the spacious terrace that allows anyone and everyone to have a good time while bathing in the sun or cooling off in the pool. Our professional responsible for today’s fantastic piece was tasked with giving the existing residence a modern look and feel. She also had to create some additional quality space and improve the flow of the layout. Working with an old timber deck, the architect transformed the space into a deep concrete balcony which stretches spaciously from one side of the house to the other. A concrete roof provides ample amounts of shade, rending this open outdoor space usable in any weather condition. 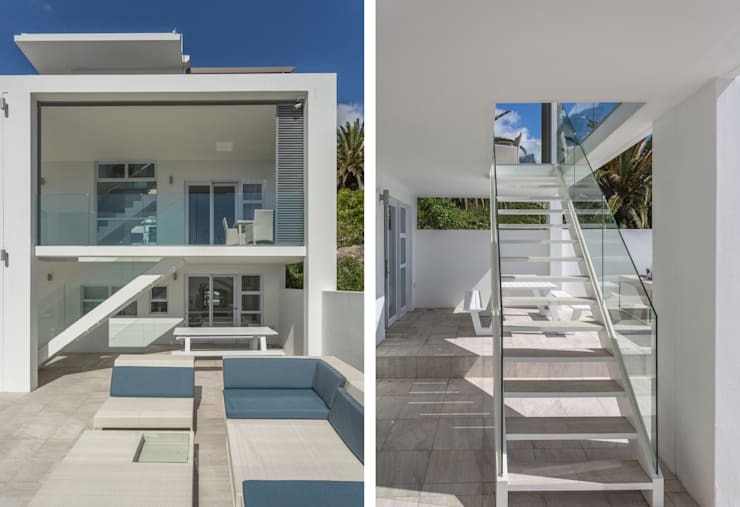 A generous amount of glass panes (whether in the form of windows or doors) occupy the façade, allowing a fresh dose of natural light to seep indoors, as well as the decadent view of the majestic Atlantic Ocean. Sliding louvered shutters also play an important part in the house’s design. Located at the outer edge of the balcony, they can be commanded to handle the incoming sunshine in case the interiors and balcony need a bit of cooling off. Having a beautiful and spacious area is terrific, but it will only take you so far in helping you to have a good time. Fortunately, this house has no qualms about that, as it sports a terrific set of outdoor loungers and seating options. 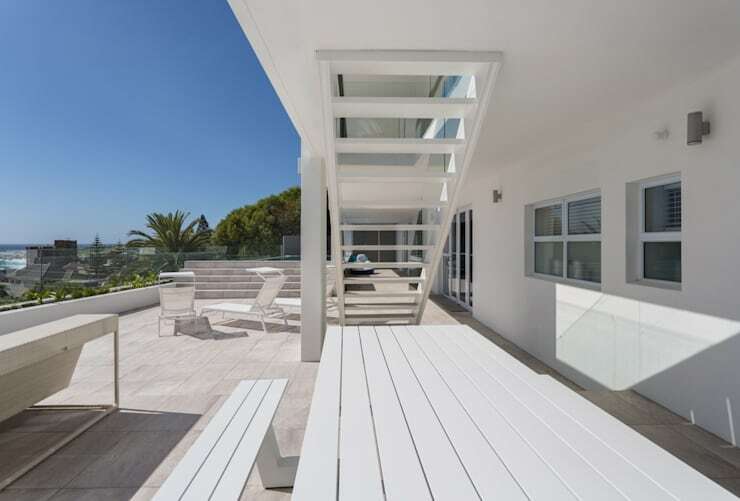 Crisp whites, light creams, and venetian blue tones all play their parts most stylishly, adorning the exterior furniture with delight and ensuring that any time spent here (whether in tranquil isolation or as part of a raucous crowd) will be most pleasurable. In keeping with the al fresco vibe, an exterior dining table has also been made available, just in case the owners want to make use of the sunny weather and breathtaking view to accompany their meal. Located right underneath the upstairs balcony, the dining spot gets its fair share of sun and shade (depending on the time of day). A most wondrous creation that definitely goes a long way in turning us green with envy! In case you want some more daydream material, check out: Heaven has an ocean view. What do you think about this house? A dream home, or not really your style?